If you are a Wonderdraft user and you keep eyeing all those fancy custom assets but aren't sure how to install them or if you are a person who has so many assets installed that you don't even know what is what anyone, this is the guide for you! Welcome to the Mythkeeper guide for users! Please keep in mind: this guide is for custom assets only. Mythkeeper does not support custom themes yet. The current version of Mythkeeper will work only for assets that normally go strictly into the "assets" directory. While Mythkeeper will do its best to help you install the asset if the author packed it flat out wrong, there is only so much it can do. Installing Mythkeep is very easy! Just go to the link below on Cartography Assets and download the installer and install it like any other Windows program. If you ever want to remove it, just use the programs & apps management as with any other software. 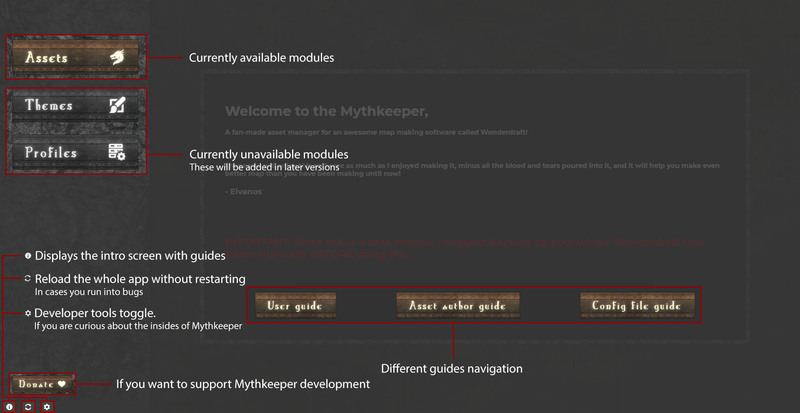 Please note: Mythkeeper is currently ONLY available for Windows platform. There will be MacOS and Linux versions later down the line! Mythkeeper never truly deletes any of your assets except for overwriting with a newer version. It packs them in ZIP format in case you ever change your mind and want to retrieve them for reinstallation later. When you are informed that something already exists if you chose to install anyway, the original file WILL be deleted irreversibly! Active - Normal Wonderdraft asset folders in the Wonderdraft's user folder. Backup - These files are moved folders from the previously mentioned type. They will not show in Wonderdraft when you launch it, but Mythkeeper can still work with them. Deleted - These files have been removed both from normal AND backup directories and have been packed into smaller ZIP archive folders. They can always be retrieved via Restore asset function inside Mythkeeper. Unified folder structure of assets - all assets that are Mythkeeper compatible will come in prebuild way. If the asset package isn't up to the standards, then Mythkeeper will inform of this and ask you if still wish to install. You will find a mostly offline of this guide inside Mythkeeper as well! An image with explanations of what different things on the intro screen do. 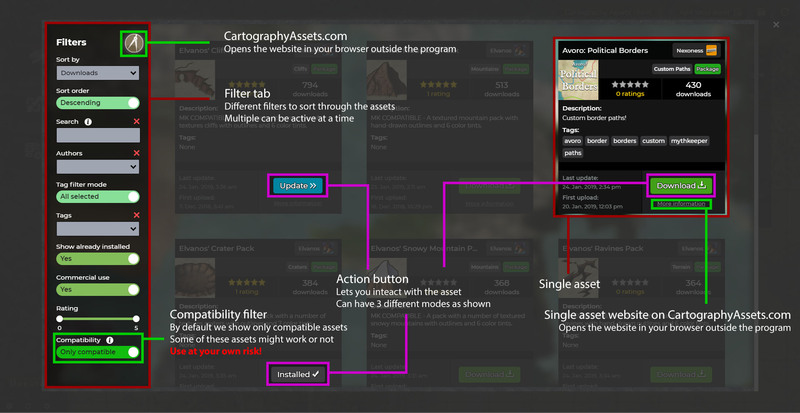 An image with explanations of what different things on the Assets module screen do. 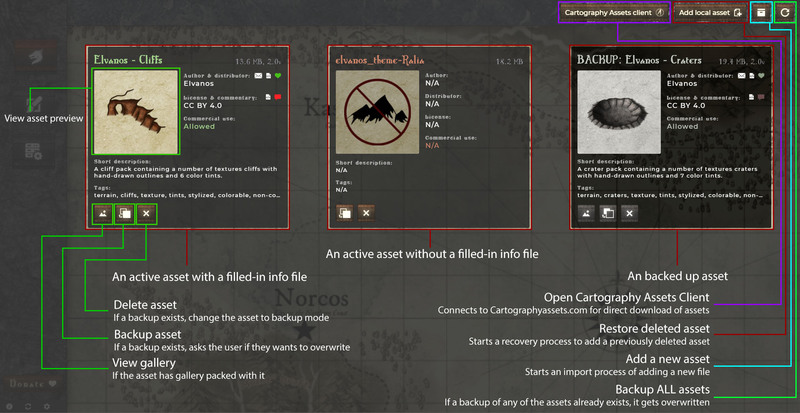 An image with explanations of what different things on the Assets module screen - CartographyAssets popup do.